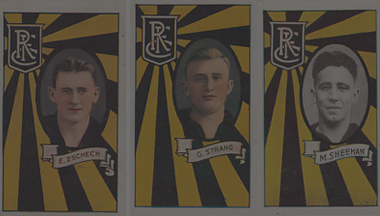 The pillar of a premiership: the broad shoulders of no. 25. Excuse me, the words are rusty. Before the bounce this Saturday I’m selling stickers on behalf of another. Three dollars each. The stickers measure 200mm × 40mm. 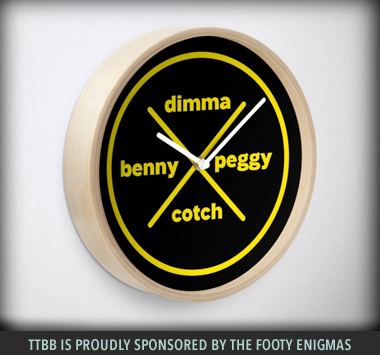 They are the artwork of Chris Rees, whom many know from his creative football designs, all of which can be found and purchased via his http://www.reesdesign.com.au/ website. 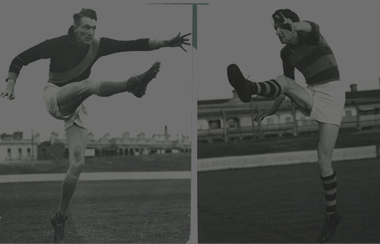 He is also the other half of this blog we created a few years back – and thank you Malcolm McKinnon for contributing a match report this week. Chris is also a friend*. Which is why I’m on a sticker-selling drive this Saturday. 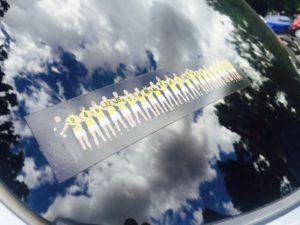 It’s also because this sticker gives me much joy and pride, and I cannot understand why every car in Melbourne driven by a Richmond fan doesn’t have one. I want to help make this happen. Before the bounce: made Adelaide’s choreographed poses look juvenile. Why a love these stickers? They’re understated, timeless, modest. They capture the essence of a day – of an experience – all of us might cherish until the end of our time. 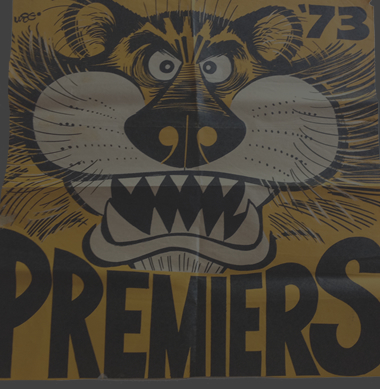 I don’t much fancy the Herald Sun’s cartoonish car sticker, emblazoned with ‘2017 Premiers’ and the caricature of a triumphant tiger. I find it a bit, well, boorish. Maybe it’s just me, but I don’t go much for football chest-pumping, especially not once a deed is done. Maybe it is all those years of yearning and frustrations. 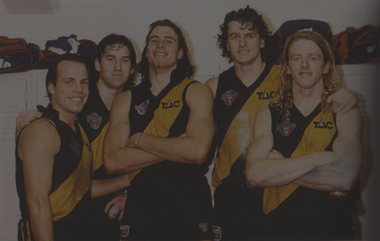 Or maybe it’s just all those Hawthorn premiership stickers that’ve shouted in my face for so long. Winners ought to be humble, respectful, modest. This sticker is all those things. It has no date on it, no words, and none are needed. 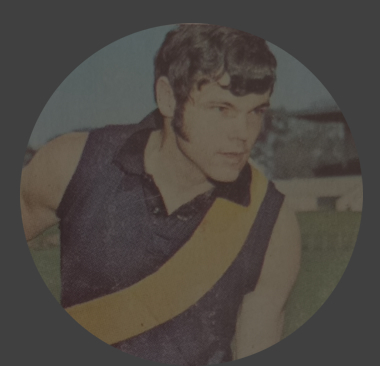 See this sticker, and all Richmond fans know exactly what it means, and all other football fans might only be envious, or quietly respectful. It is a sticker that is about togetherness, unity, teamwork, family. In that line-up of numbers, in the shape and size and stance of those bodies, there is a documentation of a day, a season, a moment, that gave us unfettered joy. Still does. 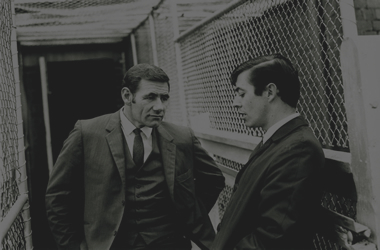 We know our players – love them for what they have done, continue to do – and in their body language see so much of the personality they express through their on-field feats. I’ve never had a sticker on our family car, until Chris produced this one. It’s on the back window, and my heart still does a little skip when I see it. Because I, we, us, were all part of it. 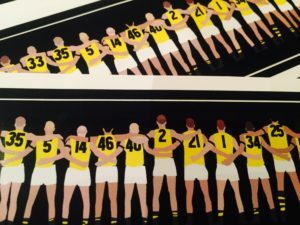 ^If you’re not going to the game, or live in regional Victoria or interstate, I can arrange to post stickers with a $1 postage charge. 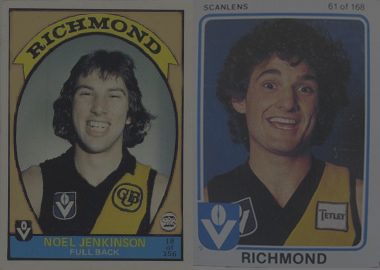 Please contact other Richmond fans in your community, see if they would like any, and act as your region’s distributor. 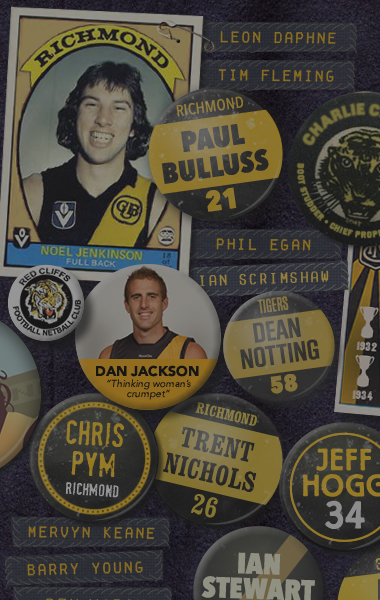 This is just another way these stickers might bring our Richmond crowd further together. 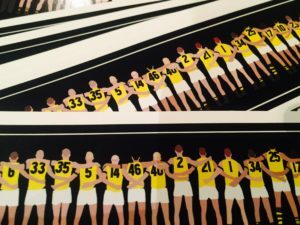 Paul Frederickson, a Tiger in Queensland, for example, has ordered 20 of them, and will be distributing for fellow Richmond fans in his part of the world. *Chris was going to give the rest of these stickers away, but I said no. I’m a big advocate of paying those in the creative industries (artists, writers, musicians, etc) what their wares deserve. All the money I collect from these sales will go to him, reimbursing his time, design and production costs. Three dollars, for an eternal thrill. 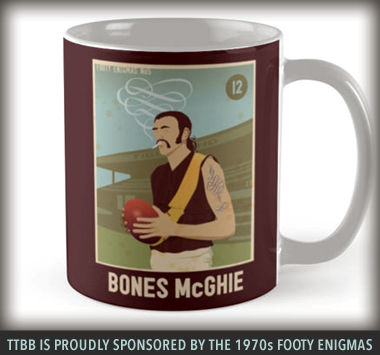 Hi John – unless Dugald has fixed you up, I suggest order through my site here. You can Paypal or direct deposit, details on the site – thank you! John, have you ordered yours online yet? 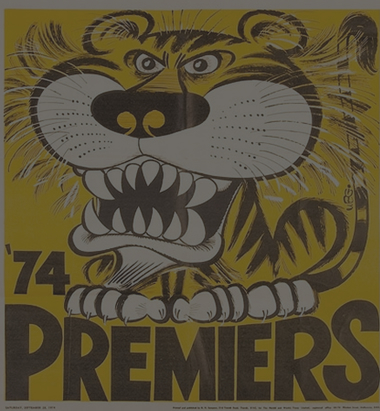 If not, I know a Canberra Tiger who’s coming to game on Saturday and picking up some stickers. Could I give them to him to give to you, and we can sort out payment later. Either way, WILL get some to you. Hey dugald, i will take 6 stickers, see you under the tree! Great Darren. thanks! I’ll have 6 stickers with your name on them. See you tomorrow. can i please order 9 of the stickers. Brenda, apologies for late reply, I’ve been busy. I have 9 stickers waiting for you. See you undrr the tree. I’ll have a STICKER sign! I’ll definitely stop by to purchase a few of these on Saturday and finally get to meet you in person! Hi Dugald, I will take 5 (or more, when I do the math) and collect out front of the G. How long will you be under the Elm tree? Shearne. will be under the elm from 12.30 to 1.30. Will be beaut to catch up. Have you down elsewhere (email?) for five. 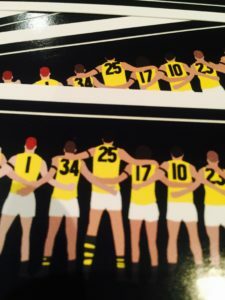 Sticker me up Dugald… see you and a thousand odd sticker buyers under the tree before we go into the G. I flew in for the game against the old foe….4 generations of not liking Collingwood is still in the TTBB archive if anybody wants a read……….Go Tigers and Go Dugald, Chris and TTBB…. Duges, I was just talking about you and TTBB this morning to a fellow tiger. I would love 4 stickers. Hi Richard! Dugald is going to run out I am pretty sure, so I suggest order through my site here. You can Paypal or direct deposit, details on the site – thanks!! Richard, how are you old chap?! beaut to hear from you. Could you please order through Chris’s website. If there’s a problem, let me know and I’ll chase it up. I can always post them up once I’ve got this weekend out of the way. Was it you who sent me a pic once from italy, of a ‘tiger’ sign burning bright at night. if you still have it, would love a copy of it! I’ll have half a dozen please Dugald! Hi Murray. If you can’t meet Dugald to get them in person, I suggest order through my site here. You can Paypal or direct deposit, details on the site – thank you! Murray, you coming up for the game? If so I ‘might’ be able to accommodate this order (but will need to go home tonight to count how many stickers I have left). It’s getting tight. LOVED the pic of you at the club recognising past life members. These stickers deserve to be seen all over the world. Such a brilliant, elegant, simple statement as you described, Dugald. Chris, you are a genius. I’ve taken the T shirt equivalent on every trip I take. Might see you under the elm tree to say hi, Dugald. Expect a welcome home hug. I’m exhausted by your travels. You should have an armchair TV travel show.